Back to School promotion – Bounce Sales & Marketing Ltd. 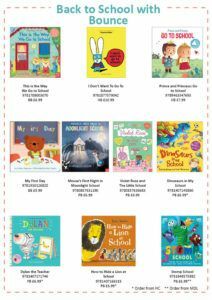 Prepare the young ones for big school with these fun picture books about the classroom covering lessons to teachers to making friends. Download the flyer, fill in the order form and contact your rep about a special discount.